Tento text se zabývá známkami Hradčany použitými v prosinci 1918 . Pro český text článku klikněte zde. 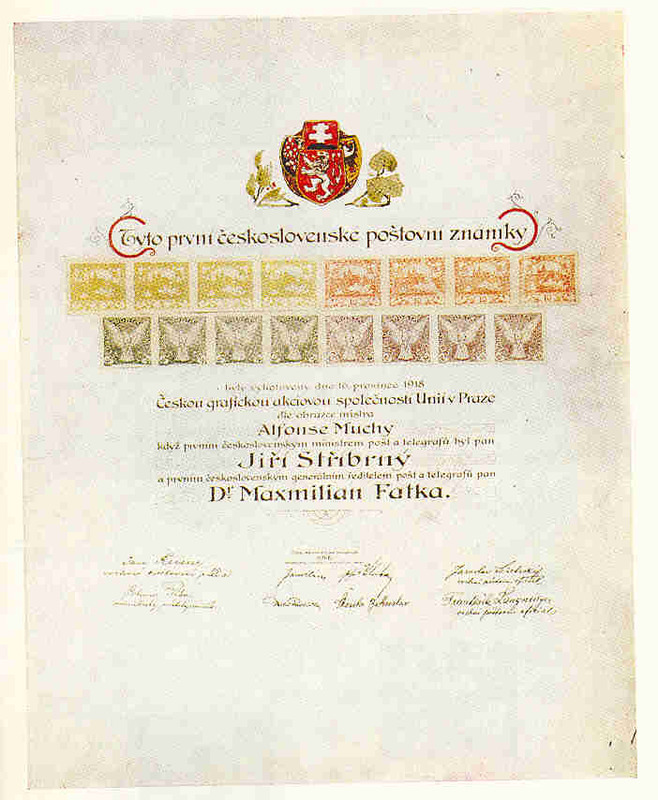 The first stamps of Hradcany set were issued in December 1918 as the first stamp of newly created Czechoslovakia . 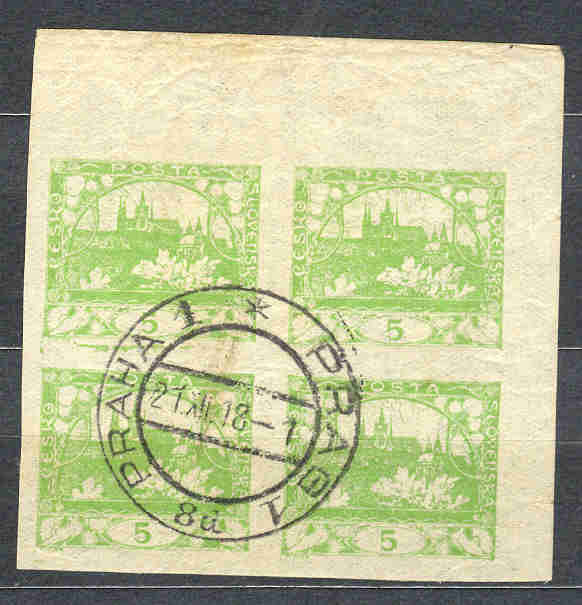 The stamps were not used very often within the month, sometimes you can find a statement, that the entires franked with the Hradcany stamps and mailed during the December 1918 are more rare than the first Austrian entires sent in June 1850 . Not so widely known is the fact, that the Hradcany stamps were originally denominated in Hellers of Austrian and not Czechoslovak currency. The Czechoslovak Crown was established first time in February 1919 (monetary reform done from Feb. 25, 1919 to March 9, 1919 known among collectors for the end of validity of Austro-Hungarian stamps in Czechoslovakia), so all stamps issued until its begin were denominated in Austrian currency and during the reform they were re-denominated into Czechoslovak currency (without any overprint, just in book keeping) . The expectation of soon establishing of Czechoslovak own currency led to making the face values of all Hradcany stamps just in figures without mentioning of currency . 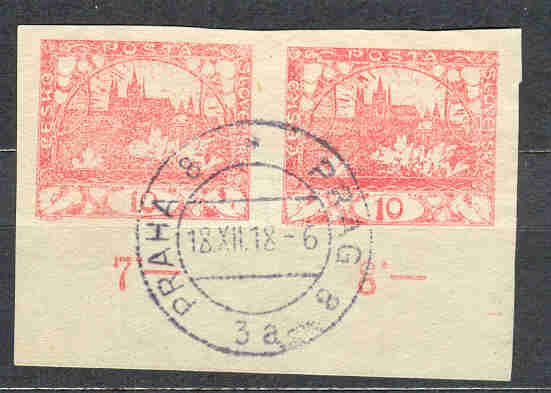 On December 18, 1918 and during few next days the stamps were sold only in Prague . The quantity of stamps was in these days so small, that every visitor of philatelic window of Main Post Office of Prague (post office Praha 1) could buy only up to 10 pieces of each stamp. The collectors usually asked to cancel the issued stamps as souvenir, but there are known covers franked with them (usually registered) mailed on the day . 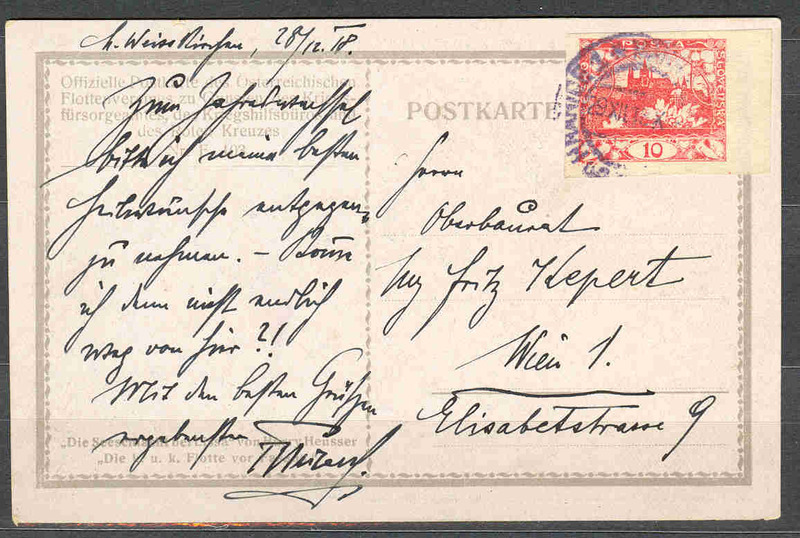 Majority of covers coming from period Dec. 18 – 19, 1918 was sent from post offices Praha 8 (sender was stamp dealer Antonin Cerny), Praha 12 (sender was stamp dealer Frantisek Sasek) and Praha 1 (others dealers + collectors, especially Mr. J. Baumgarten). Thanks to activity of above mentioned persons we can state, that the sentence about rarity of Hradcany entires in comparison to entires with the Austrian issue of 1850 is elevated. Based on my own searching the dealer Cerny mailed only on Dec. 18, 1918 at least 10 pieces of registered letters franked with Hradcany stamps (no. 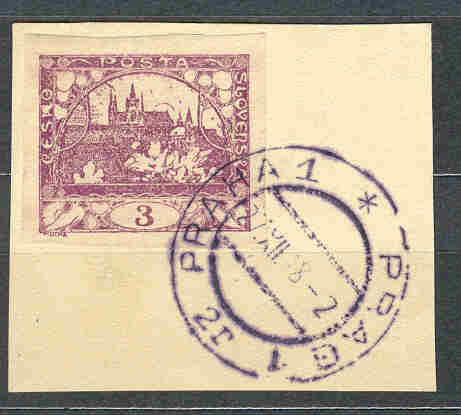 of registered labels of post office Praha 8 known to me on his covers are 3417 and 3426 ); the dealer Sasek at least 9 pieces of registered letters franked with Hradcany stamps (no. of registered labels of post office Praha 12 known to me on his covers are 732 and 740 ) and the collector J. Baumgarten at least 16 pieces of registered letters (to Vienna, Austria : no. of registered labels of post office Praha 1 known to me on his covers are 6651 and 6666). During December 1918 the printing house Ceska graficka unie was overloaded by the printing of Hradcany stamps. 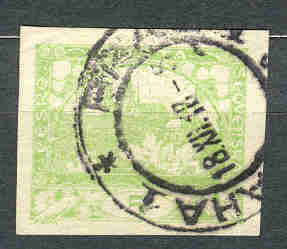 The quantity of stamps rapidly increased and after Dec. 20 the Hradcany stamps could be distributed outside of Prague as well as to smaller post offices as well. From this second period there is known more cards and covers (usually non-philatelic like Christmas and New Year ´s cards) . New Year card of 1918 bearing mixed franking between two Austrian stamps and one Hradcany stamp. Total postage amounted to 11 Hellers, so the entires was overfranked by 1 Heller, which is normal overfranking from that time. 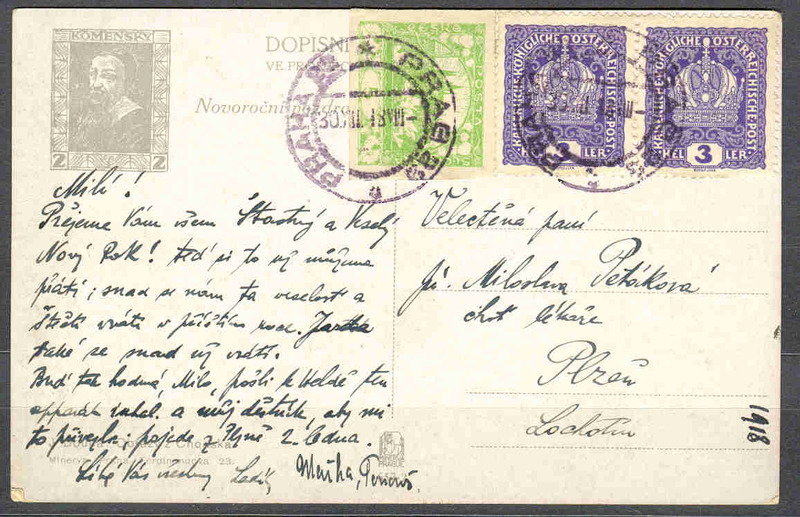 New Year card of 1918 franked with 10 Hellers Hradcany stamp in domestic postal traffic . New Year card of 1918 franked with 10 Hellers Hradcany stamp in international postal traffic (sent to Vienna in Austria) . 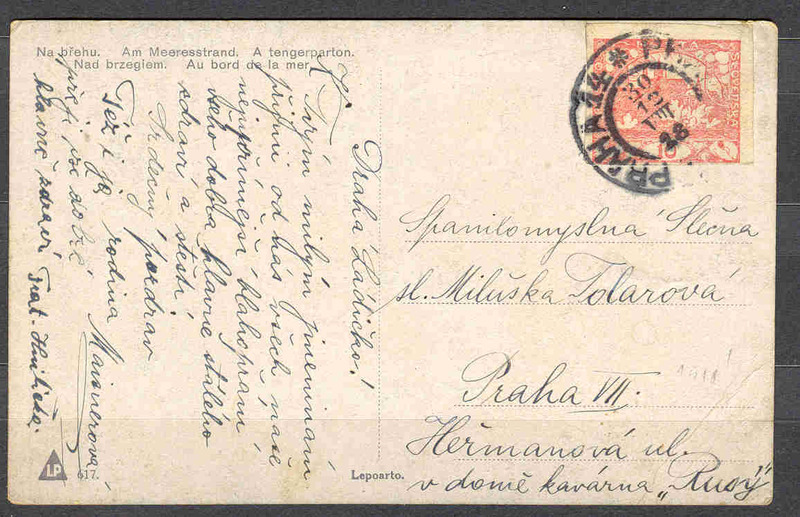 Majority of all existing entires of December 1918 has been franked with Hradcany 5 Hellers and 10 Hellers stamps. There are known some pieces of 3 Hellers stamps cancelled in December + few entires, on other side there has not been found any entire franked in December 1918 with 20 + 25 Hellers Hradcany stamp. Not widely known among collectors is existence of commemorative sheet issued by Czechoslovak Postal Administration to celebrate issue of first Czechoslovak stamps (Hradcany as well as SOKOL issues) . The sheet was issued on Dec. 18, 1918 as well . Here is its English translation: ”These first Czechoslovak stamps were printed on Dec. 16, 1918 by printing house Česká grafická unie in Prague as per drawing of Alfons Mucha, when the position of first Czechoslovak Minister of Post and Telegraphs was performed by Jiří Stříbrný and the position of first Czechoslovak General Director of Postal Administration was performed by Dr. Maxmilian Fatka ” . The commemorative sheet was also printed in the Česká grafická unie printing house. Interesting are signatures of another persons participating in issuance of first Czechoslovak stamps . The most popular person of them is Mr. Jaroslav Lešetický, famous collector, journalist and expert of Prague, who was employed by Czechoslovak Postal Administration (and in past by Austro-Hungarian Postal Administration as well) . 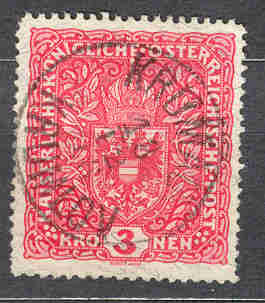 As you know, the Hradcany issue can be collected from various reasons: color differences, various perforations and papers, printing errors, ”watermarks”, unissued stamps, single frankings, mixed frankings with another issues and many others . Goal of the article was to inform you about not so common procedure how to collect the stamps of the set. Good luck in searching the at the moment not known material ! If you find any new cover or card franked with Hradcany in December 1918, please be so kind to send me an e-mail (lubor.kunc@seznam.cz ) and I will list your discovery in my list of existing entires . No part of the article my be reproduced or reprinted in any form or by any means - graphic, electronic, or mechanical, including photocopying, taping, or information storage and retrieval systems without written permission of the author.